Submitted by beirutnwn on 2017-04-16 12:00. Dragonlance, Age Of Mortals, @maxroleplay, Epic character progression. 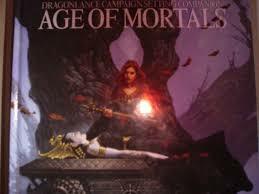 Age of Mortals is an ongoing creation designed as a vast mysterious roleplaying environment using Dragonlance Campaign. Places include Hopeful, Castle Engeven, The Temple of Death, Scar'd keep, Temple of elemental evil plus 275 Area's to explore. CEP2.62 required. Questions or comments contact: @maxroleplay on twitter I took everything I could use from this vault to make this one, one of the best. I play it, it still amazes me. I travel around with my party members and sometimes things are so shocking they make us roar in laughter. thanks to StilleVande for hosting our server currently showing in the nwnlist. I still remember hosting this myself in 2006 to a six thousand playervault 30 person server 24 hours a day. Recently I open the tool set and connected a series of campaigns to the original world so huge it's given us countless hours of game play and we have only explored like %10 of the world. I know I rant. there is just so much history in this mod.